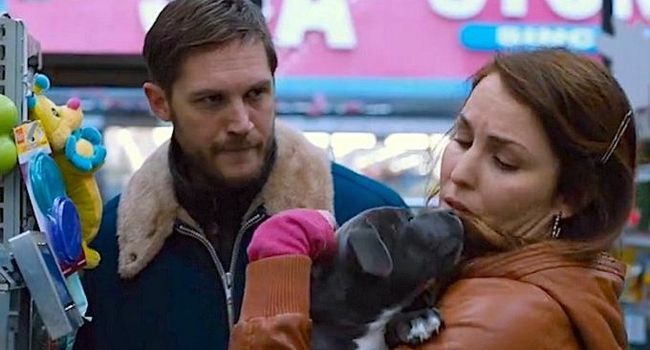 London-born actor Tom Hardy cements his increased movie stardom as a slow-burning tough-guy on the fringes of organised crime in Michaël R. Roskam’s vivid Brooklyn-based noir tale “The Drop”. “Nobody sees you coming, do they,” a cop tells Hardy’s character and the actor’s ability to hide his intelligence behind slow movements and considered silence adds greatly to the movie’s suspense. Adapted from his own short story titled “Animal Rescue” by crime writer Dennis Lehane, the atmospheric and tense little thriller tells of a nondescript New York tavern that is required at random to be the drop for the daily takings of a band of Chechen criminals. Grim and moody with a score by Marco Beltrami and Raf Keunen that pulses with foreboding, the film follows events that will lead to a raid on the bar in question when its secret stash is at a peak on the day of the Super Bowl. Hardy plays Bob, a taciturn guy who works at the bar run by his cousin Marv (James Gandolfini) but owned by Chechen mobsters. Bob is the kind of guy who will adopt a beaten puppy he finds in the trashcan of a woman named Nadia (Noomi Rapace) who lives in the neighbourhood. They also begin a tentative relationship. A robbery at the tavern brings the threat of retribution by the mobsters and interest from the police as Nadia’s brutal ex-convict boyfriend Eric (Matthias Schoenaerts) shows up to claim the woman and the dog. Belgian director Michaël R. Roskam sets a deliberate pace and builds a sense of increasing dread as Bob and Nadia grow closer, Marv begins to prove unreliable, Eric becomes more menacing and the grip of the Chechan gangsters tightens. It’s rainy nights and gunplay as an old-fashioned film noir should be and “The Drop” should earn it’s way smoothly into the affections of fans who like their heroes on the quiet side. Venue: Toronto International Film Festival. UK release date Nov. 14, 20th Century Fox. Cast: Tom Hardy, Noomi Rapace, James Gandolfini, Matthias Schoenaert; Director: Michaël R. Roskam; Writer: Dennis Lehane; Director of photography: Nicolas Karakatsanis; Production designer: Thérèse De Prez; Music: Marco Beltrami, Raf Keunen; Editor: Christopher Tellefsen; Producers: Peter Chernin, Dylan Clark, Mike Laroca; Production: Chernin Entertainment, Fox Searchlight Pictures. Running time 106 minutes. This entry was posted in Film, Reviews, TIFF Toronto International Film Festival and tagged 'The Drop', 20th Century Fox, Dennis Lehane, James Gandolfini, Marco Beltrami, Michaël R. Roskam, Noomi Rapace, Raf Keunen, TIFF, Tom Hardy, Toronto International Film Festival. Bookmark the permalink.